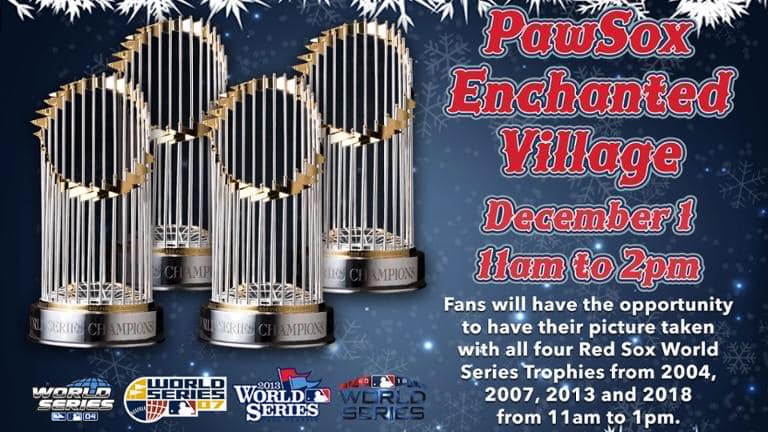 The Pawtucket Red Sox will offer their 4th Annual "PawSox Enchanted Village" Holiday Party at McCoy Stadium today from 11 am - 2 pm. 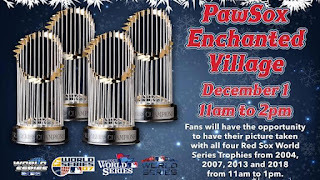 The event, in which the ballpark becomes a Winter Wonderland, is free and open to fans of all ages. Fans will also have the first opportunity to purchase a special Star Wars Plan ticket package. Fifteen short years ago, no one would have ever thought this possible, however…since 2004 the Boston Red Sox have won not one, not two, not three, but four World Series and all FOUR trophies (2004, 2007, 2013, and 2018) will make a special appearance at McCoy Stadium from 11 am - 1 pm during today's event. Fans can get up close and personal with all four of the coveted trophies and, of course, take photos with these treasured pieces of Red Sox history. In addition to the trophies, a pair of former Red Sox pitchers will be live in person to meet fans. The always-popular Dennis "Oil Can" Boyd, who won 16 games in 1986 to help the Boston Red Sox reach the '86 World Series and went 78-77 in 214 major league games with the Red Sox (1982-89), Montreal (1990-91), and Texas (1991), will be in attendance to take photographs and sign autographs. Southpaw Lenny DiNardo, who pitched 22 games for the historic 2004 World Champions and has been a NESN pre and post-game host during Red Sox telecasts the past few seasons, will also be on hand in the PawSox Baseball Store with Oil Can. Red Sox mascot Wally, mascots Paws and Sox, as well as Santa Claus will greet fans young and old. Furthermore, the Boston Red Sox will provide access to their "Red Sox Virtual Reality" which will be set-up in one of the McCoy suites. The Virtual Reality offers viewers a 360 degree look around Fenway Park, giving fans the experience that they are standing on the field with the players, at batting practice, in the dugout, and other fun Fenway experiences. The Holiday Party at McCoy will feature a number of other popular attractions again this December. Fans will be greeted at the Main Gate by Paws, Sox, and Wally before traversing a special "behind-the-scenes" path throughout the ballpark. As they tour the decorated "Hall of History" and peruse the memorabilia along the walls, fans will be able to enter several "workshops" in the suites to indulge in various activities and refreshments. Carolers from Pawtucket's Jacqueline M. Walsh School for the Performing and Visual Arts will provide musical entertainment. Youngsters are invited to take Batting Practice inside the home batting tunnel, which has been transformed into a Fenway Park-like Wiffle Ball field. Weather-permitting, folks can wander out from the PawSox Clubhouse to the home team dugout and to the field, where they will be greeted by a large Christmas Tree at home plate. Families are welcome to take photos around the tree. Fans can then walk through the Visitors' Dugout and head in to the Visiting Clubhouse, which will be stocked with food and drink, including traditional ballpark fare and other refreshments. Attendees will have the chance to visit the Player's Wives Lounge inside McCoy to shop for used equipment and artifacts during our annual "Ballyard Sale". Fans and collectors can purchase actual game-worn uniform pants, as well as bobbleheads and other one of a kind memorabilia and art work. Fans are encouraged to donate a new, unwrapped toy for a child to be placed in the Toys for Tots box inside the main entrance gate. Gifts will support the United States Marine Corps Toys for Tots Program. NOTE: We love sharing fun things to do around town and thought our readers would love this! No compensation was provided in exchange for this post.